Stress is plain and simply a killer! When the Flintstones roamed the caves of our earliest ancestors, they survived only because of their stress capability. When some large animal was eyeing you, licking its lips in anticipation of a tasty treat, you needed the extra energy and power that came from high stress levels. All your energy was shunted into your arms and legs, and away from repair of your vital organs, so that you could run or fight. Once the crisis was over, your nervous system returned to normal and all was well. 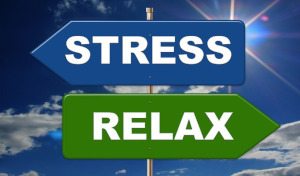 However, when your stress levels skyrocket because you’ve been called to the Big Boss’s office and you’re afraid of being laid off, you don’t discharge those stress hormones and chemicals. Instead cortisol and other such harmful and even deadly chemicals linger on in your blood stream, wreaking havoc with your body. If this goes on for years – and it almost always does – illness and disability is a highly likely result. So here are five simple, easy, natural ways to reduce stress – and they won’t cost you much of anything. #1: Your breath: simply put your attention on your breath. You don’t have to try to “control” your breath or change it or affect it in any way. You’re simply taking your attention off your churning mind and on to the rhythm and calmness of your breath. Yes, your Monkey Mind will continue to chat and drag your attention away, but that doesn’t matter. Don’t get upset or frustrated. Simply peacefully bring your attention again and again to your breath. Your entire body and mind – your bodymind – will calm down. #2: If you can, walk barefoot in the grass. The earth has an electrical charge that boosts your immune system and gives you a much larger supply of life-saving antioxidants, as well as calming your nerves. #3: I have a tool called a “bonger”. It’s a hard rubber ball attached to a metal handle about a foot long and it’s for massaging areas of your body that are hard to reach. But a plain old tennis ball will work equal wonders, even though it’s not as convenient. It’s especially relaxing to put your tennis ball under your feet and roll them around. Also, roll your ball between your hands. The entire field of reflexology is based on the understand that all kinds of nerves end in our hands and feet and massaging them is extremely relaxing. #4: Have you ever tried dry skin brushing? It’s wonderful and we have an entire article on it linked in the sentence before. If you’ve ever been tempted, be sure to check it out. You will feel luscious after a few days. #5: I love kale – but I don’t like the hard stalks. Ditto broccoli. But these veggies and others like them are powerhouses of nutrition and can be easily made into a drinkable broth that is simply loaded with all kinds of vitamins and minerals. These five ways of relieving stress are do-able, inexpensive, simple and actually pleasurable. I use all five of them so I KNOW that you will feel better for using any of these methods.